TORONTO, ONTARIO--(Marketwire - April 24, 2008) - George A. Brown, CEO of both Duran Ventures Inc. (TSX VENTURE:DRV) and MacMillan Gold Corp. (TSX VENTURE:MMG), is pleased to provide the following results from the Pasacancha Ag-Au-Pb-Zn Target in Ancash, Peru. David Bending, P.Geo., and Cary Pothorin, P.Geo., are Qualified Persons as defined in National Policy 43-101 and are responsible for all technical information contained in this joint news release. The results being reported are from various Pasacancha Tunnels. The results continue to demonstrate the presence of a large silver and base metal mineralized system with excellent potential to be advanced to a large volume open pit deposit. - Main Access Tunnel Central Portion: 384 metres sampled width (220 metres estimated true width) with average values of 0.17 g Au/t, 69.1 g Ag/t, 765 ppm Cu, 5,623 ppm Pb, and 9,420 ppm Zn. - Tunnel E: 147 metres sampled width (58.8 metres estimated true width) with average values of 0.07 g Au/t, 53.3 g Ag/t, 453 ppm Cu, 8,513 ppm Pb and 11,533 ppm Zn. - Tunnel F: 147 metres sampled width (58.8 metres estimated true width) with average values of 0.28 g Au/t, 56.1 g Ag/t, 447 ppm Cu, 2,951 ppm Pb and 5,287 ppm Zn. Including 1.91 g Au/t, 378 g Ag/t, 1,105 ppm Cu, 2,279 ppm Pb and 1,664 ppm Zn. - Access Tunnel: 111 metres sampled width (111 metres estimated true width) with average values of 0.18 g Au/t, 65.9 g Ag/t, 945 ppm Cu, 8,700 ppm Pb, and 4,822 ppm Zn. - Terminated in mineralized material, with the last 72 meters showing average values of 0.24 g Au/t, 80.7 g Ag/t, 1,009 ppm Cu, 10,704 ppm Pb, and 5,608 ppm Zn. Additional sampling and geological studies are ongoing with progressive rehabilitation and systematic work in other tunnel levels as well as detailed surface studies to provide three-dimensional geological controls for interpretation and planning of continuing programs. Diamond drilling is planned subject to permitting and drill availability. All samples are delivered to the Lima laboratory of Inspectorate Services Peru SAC (a certified laboratory) for preparation and multi-element ICP analysis followed by AQR/AA assaying for base Metals and 30 gram FA/AA assaying for Au and Ag. The company has a QA/QC protocol in place including the use of duplicate sampling by outside labs, certified standards and blanks and secure care and custody of samples. Investors are invited to visit the MacMillan Gold IR Hub at www.agoracom.com/IR/MacMillan where they can post questions and receive answers or review existing questions and answers. Investors may also email questions or request to be added to the investor email list at MMG@agoracom.com. Duran Ventures Inc. and MacMillan Gold Corp .are Canadian resource companies listed on the TSX Venture Exchanges: Symbols "DRV" & "MMG". The TSX Venture Exchange has not reviewed and accepts no responsibility for the adequacy or accuracy of this news release. 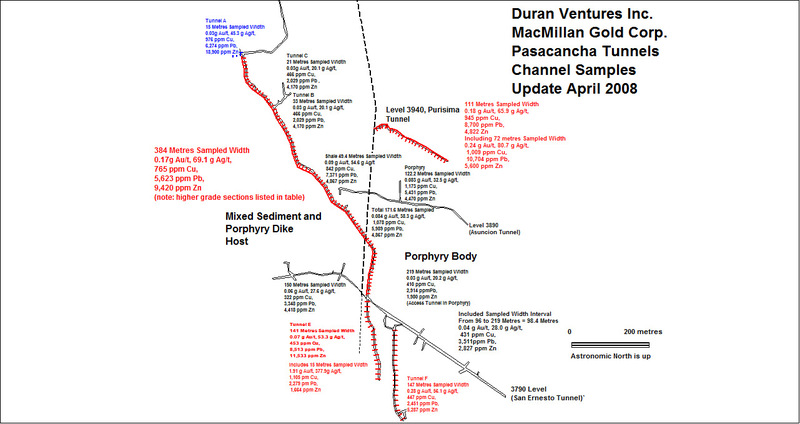 Duran Ventures Inc. and MacMillan Gold Corp.